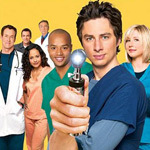 As of 2006, Scrubs is still going strong, and Buena Vista (who releases the DVDs) is keeping pace. The sixth season is showing on a TV near you, while the fourth season is now available on yet another three-DVD box set. Season three ended with Turk and Carla getting married, and with J.D. and Elliot still at each other’s throats. Season 4 picks up soon thereafter and follows in the various aftermaths. It also marks the graduation from “resident” to “internist” for our newbie protagonists. And I may be imagining things, but it seems the background characters are starting to get a little more screen time, too. By the fourth season, Scrubs has hit its stride, and except in the details, there are very few surprises. Sure, there are new developments (one of the main characters gets diabetes) and the occasional new character (Heather Graham as a staff psychiatrist), but Scrubs is still Scrubs, thankfully. None of the characters seem to be preparing to jump any sharks. Like its predecessors, Season 4 comes with decent, if a little more streamlined, packaging. The three discs still fit in the middle and right sections of the three-panel box. Previous editions had some nifty “x-ray” gadget or fancy slipcase, but this box is all business. Likewise, the extra features seem a little more streamlined. There are as many as before, but they don’t seem as creative or disparate as previous extra features. In fact, the first three different extras are basically all the same. Each features the writers and actors describing the show’s characters. For anyone who has seen more than about three episodes, this is all old hat. Donald Keeps Talking is a fifteen-minute interview with Donald Faison (Turk). After about three minutes of some of the least interesting interview questions (“What attracted you to the role?”) I moved on to the next piece. The deleted scenes and alternate lines, as on previous DVDs, are not bad (thankfully, there is a “Play All” option). Most of the deleted scenes are entertaining, and were probably only cut for time. The alternate lines, likewise, are mildly entertaining. My only complaint about these features is that they’re almost not worth the effort. They are not as rapid-fire as I’d like. The DVD presents not only the deleted scenes and alternate lines, but also the context from which they were cut, which makes these segments heavier than they need to be. Picture and sound quality are both very good. Buena Vista is clearly working from good sources, and the DVD probably looks better than what you might see on broadcast. Pop in the DVDs and watch the episodes, one or two at a time. Skip the extra features unless you simply can’t get enough, in which case, watch the deleted scenes and alternate lines. Skip the other features entirely.